All of the entrepreneurs of Mafraq governorate gathered with Medair and Near East Foundation teams with her Excellency senator May Abu Alsamen for a group picture in Northern Jordan. Irbid—According to the World Bank, women’s participation in the workforce is only 20 percent in Jordan. Women control fewer assets, have less autonomous income, and less control over household decisions compared to their male counterparts. The Near East Foundation (NEF), with support from Medair, is strengthening the economic resilience of vulnerable Jordanian families through business training, coaching, and start-up grants for women entrepreneurs in Irbid and Al-Mafraq. Both cities lie approximately 10 miles from the Syrian border and host close to 140,000 and 75,000 Syrian refugees respectively. The Syrian refugee crisis has affected poor Jordanian communities, increasing competition over housing and food. In three-months, NEF has trained 91 women and of those, 87 have developed business plans, and 65 have received grants to start their own businesses. 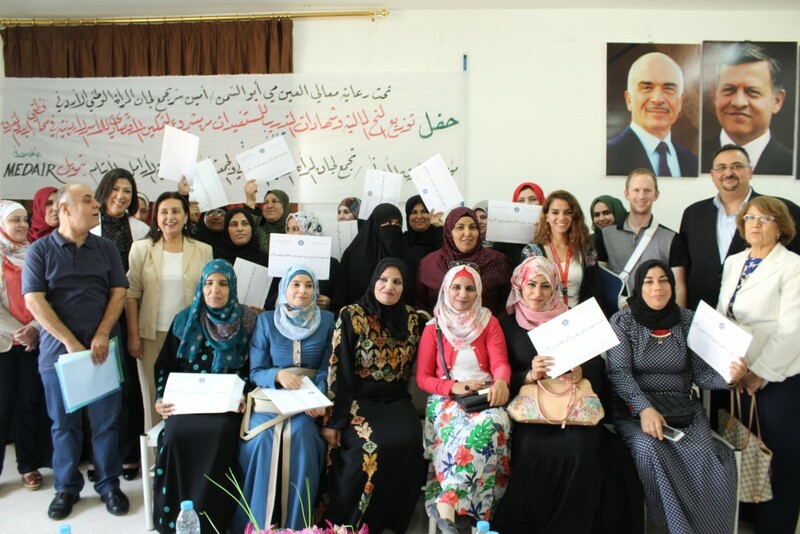 Last month, NEF and it’s local partner, the Jordanian National Forum for Women (JNFW), hosted a closing ceremony in Irbid to celebrate these women’s achievements and present them with their grants. She continued, “NEF believes that woman can transform their communities.” Her remarks rendered an audible reaction as women began to stand up and speak about their experiences. Read more about NEF’s work in Jordan.